After releasing the melancholy and barely promoted Burning Bridges as their final album obligation to Universal Music Group-owned Mercury Records after 32 years, it seemed like the band had a bit of a chip on their shoulder about the state of the music industry and their record label. That release wasn’t really promoted by the band or Universal/Mercury. Though the official line is it was “for the fans”. That was actually a good album, though it was pretty obvious the band was just releasing something to finish up their contract and move on. Just listen to that album’s final track to understand the frustration the band felt in dealing with their label. Well. That spat with the label didn’t last long as the band once again finds themselves on Universal’s Island Records label. So while the band’s label is pretty much the same again, there’s a few changes going on with personnel. Longtime bassist Hugh McDonald is finally listed as an official member of the band. The same goes for new guitarist Phil X, who has been playing with the band live ever since Sambora quit a few years ago. This marks Phil’s first album appearance with the band although I’ve read he played very little and a lot of the guitar work was left up to (surprise surprise) John Shanks, who is also now touring with the band as a second guitarist. I really enjoyed the somberness of Burning Bridges and found a lot to enjoy on What About Now, but This House Is Not For Sale basically puts the band back into the bland category. It’s mostly a collection of generic anthems, lifeless rockers meant to be uplifting, and tiresome ballads that fit right in with the band’s most uninspired efforts from the mid/late ’00s. I can’t not the ENTIRE album though. 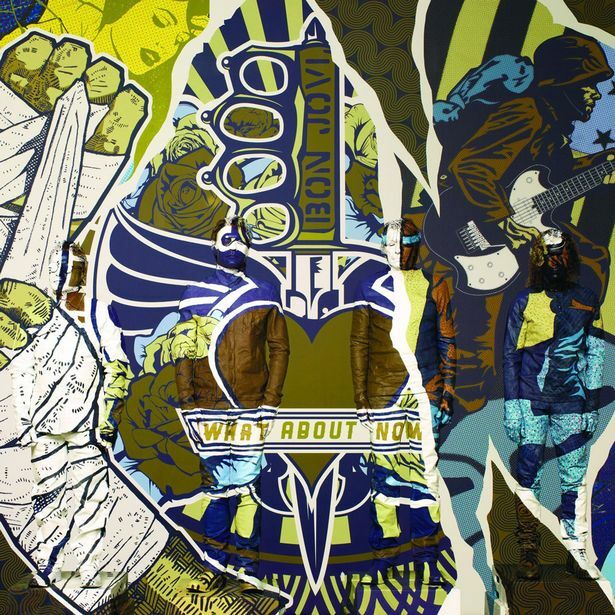 “Knockout” is a fairly competent heavy rocker (well, heavy for Bon Jovi) while “Labor of Love” sounds like it could’ve been on Burning Bridges, and “Real Love” is a pretty decent modern-day ballad for the band. However, my advice to Jon? Get rid of John Shanks, bring back Richie Sambora, and let him co-write every single song on the next album. This one is only for die-hards. Burning Bridges is an interesting project. It’s the band’s thirteenth studio album, yet the band is already working on a fourteenth “full-scale” studio release and there seems to be very little promotion for this album coming from the band. True, they did release “We Don’t Run” as a single and will presumably be featuring that song on their upcoming international tour, but the band’s official website, Facebook and Twitter pages make no mention of Burning Bridges. You can’t even buy it from the band’s official merchandise website. Jon Bon Jovi has been quoted as saying this album is “for the fans”. Not sure what that means exactly or how that is. Burning Bridges is a collection of “songs that weren’t finished, that were finished, a couple of new ones,” according to Jon. From little information is out there about this album, these are songs that the band had worked on over the last 10 years. I’m not sure how much of a part former guitarist Richie Sambora had in this album. He’s credited with a co-write on “Saturday Night Gave Me Sunday Morning” but I’m not sure if a single note of his is used on this album or if Jon called in the likes of touring guitarist Phil X or producer/songwriting partner John Shanks to fill-in. Despite the oddness surrounding this album and the sadness that this is the last Bon Jovi album that Richie Sambora is going to have a part in (well, for now at least…), the songs are quite enjoyable. In the last 10 years, three of the four albums the band has released have been extremely bland and boring modern rock, IMO. So it’s surprising that I’m enjoying so many of these songs since their origins go back to a few of those albums, apparently. For the last few years, I’ve found myself enjoying the modern Bon Jovi sound more and more. I still don’t care for Have a Nice Day, The Circle or Lost Highway, but What About Now was very good and I really liked the new songs that were included on Greatest Hits. 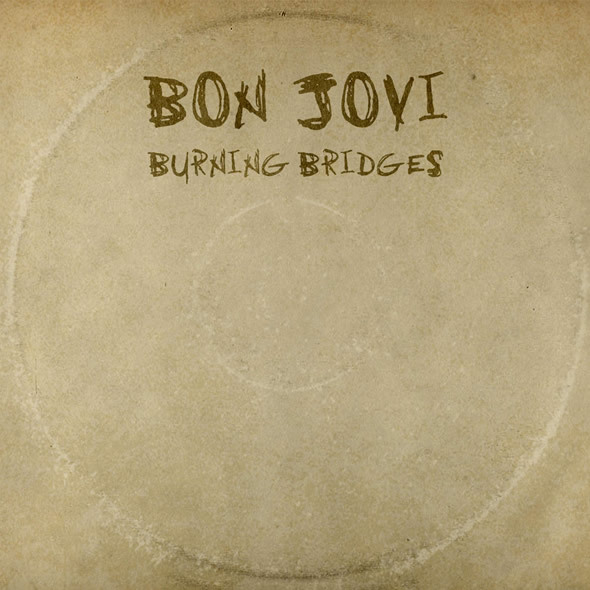 Even those some of the songs from Burning Bridges must originate from some of the sessions of the albums that I don’t like, Burning Bridges itself is a very enjoyable effort as long as you can get past the fact that this band will never write another “Bad Medicine” or “You Give Love a Bad Name”. Most of the album is a fairly mellow affair full of ballads. The album even opens with a ballad! “We Don’t Run”, “Saturday Night Gave Me Sunday Morning” and “I’m Your Man” are the only truly rambunctious songs on the entire album. Oh, and about that cover? You’d think it would be a natural for it to be released on vinyl, right? NOPE. It’s available only on CD or digital download. WTF? Maybe at some point later it will be, but I doubt it. The CD comes in a cardboard slipcase and that’s it. There’s the track-listing on the back and that’s it. There’s no pictures, no printed lyrics, no insight as to the unique nature of this album or the songs, no band credits. It’s a bare-bones and, frankly, sad way for a multi-platinum act such as Bon Jovi to leave their record label of 30+ years. Jon has a few things to say about Mercury Records on the album’s last track (turns out Burning Bridges isn’t a reference to Richie Sambora at all) with a loose, rowdy acoustic sing-along number that has a vibe like Great White’s “Wasted Rock Ranger”. Despite the odd treatment this release has been given by the band and (soon-to-be former?) record label, Burning Bridges is a very strong release for the band. The mood of the album may be a bit dour, melancholy and cynical and it could use a few more rockers (and Richie) but Burning Bridges is a great release for the year and gives me hope for what the band can accomplish with an all-new release in 2016. So after Greatest Hits came out in 2010 with four new tracks, I had high hopes for a new Bon Jovi studio album. Yes, I know those new tracks still represented and sounded like the “mature” and less-rocked out Bon Jovi we’ve known for the last 10 years or so, but I still liked them a lot. I guess it’s sign I’m getting older myself. Cut to the release of this album’s first single, “Because We Can”. It didn’t knock me out but I thought, “okay, this is decent”. Cut to samples of this album on Amazon.com and it sounded like such a downer and slow moving album. Granted, I was only hearing about 30 seconds of each song but my anticipating wasn’t as great anymore. Cut to now..? I’m LOVING What About Now. It took about 3 spins before it all started to click with me. Again, this album is really no different than Have A Nice Day, Lost Highway or The Circle. It’s all within that same realm of “hey, look at us, we write thoughtful songs with social commentary and have no interest in playing hard rock anymore, so take us seriously”. But the difference here is that Bon Jovi’s need to be on the level with U2, Coldplay and (still) Bruce Springsteen is actually working for me this time. The band is still writing anthems that the older and presumably more mature Bon Jovi demographic can enjoy (“Because We Can”, “What About Now”, “Army of One”) while still catering to the fans they gained with surprising success of the country/acoustic-tinged Lost Highway (“What’s Left of Me”, “The Fighter”). There’s also a number of mellow moments and ballads on the album. Perhaps too many but it doesn’t change the quality of the songs themselves. “Because We Can” is probably the most upbeat song on the album and I find myself wishing there were more bombastic moments like that. It’s a great way to open the album but the energy is downhill after that. Despite the shift in style & attitude over the last decade, Bon Jovi has always offered up at least one classic sounding Bon Jovi ballad per album. I think “Thick As Thieves” is supposed to that one song on this release and while it’s a good song, it seems to fall short just a bit of what I think they were aiming for (perhaps they should’ve enlisted the aid of Desmond Child for that one). Speaking of songwriting credits, Richie Sambora only has four credits on the standard version of the album. I won’t get too much up in arms about it because I do like the album but I think it’s a bit sad that Jon has relegated Richie (and everyone else in the band) to the status of basically being employees instead of band-mates. In this day and age, you play and write what Jon tells you to, I guess. The bonus tracks are really good on this deluxe edition. “With These Two Hands” is another inspirational anthem, “Into the Echo” puts the band back into their thoughtful mood and “Not Running Anymore” is a somber Jon Bon Jovi song that he wrote and played solo for the movie Stand Up Guys that’s sure to please Lost Highway/Blaze of Glory fans. While the band’s shift from hard rock & pop-metal to an adult contemporary act has been painful, with What About Now I think they’ve made the transformation a success. Is this a classic album or even what I want to hear from Bon Jovi? No, but it’s still a very good release and easily the best thing they’ve done since 2002’s Bounce. Hard to believe I haven’t spoken about this ’80s classic yet! In fact, this is one of the best rock albums of all time, in my opinion. Alongside other multi-platinum ’80s hard rock monsters like Back In Black, Pyromania and Appetite for Destruction, Slippery When Wet was a game changer and has continued to influence bands up until today. When I first got into the CD game, this was one of the first CDs I owned because Bon Jovi was one of the first bands I got into when I actually started taking an interest in music (Guns ‘N Roses & Poison were my other early faves as a teenager). Still, I have remembrances of this album when I was a kid. This was an album that you would’ve had to have been deaf to avoid in ’86/’87. MTV, radio, skating rinks, school dances, my sister’s stereo… It was all over the place! Some of the songs have aged worse than others because of the keyboards (“Without Love”, “I’d Die For You”) but I still say every track is a classic and they’ll all have you singing along in no time. Virtually any song here could’ve been a hit if it went to radio. Slippery When Wet is to Bon Jovi what Hysteria is to Def Leppard and the 12x platinum sales in the U.S. alone prove it. 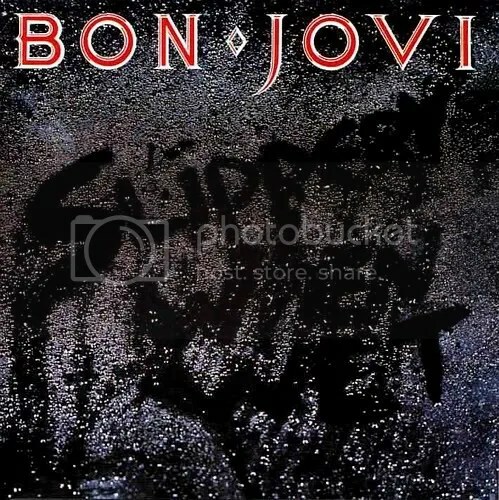 Timeless and yet still a sign of the times (this album always makes me think of the typical ’80s mall) Slippery When Wet is a pop-metal masterpiece (yes, Jon, you were once a pop-metal band) that I’ll always keep coming back to. Essential listening for ’80s rock fans. Highlights: Um… All of them. I’m a huge Bon Jovi fan. They’re one of my favorite bands, which is funny because I really can’t stand their last few albums and their shift towards country and adult contemporary rock/pop. Also, I’ve become somewhat jaded because it’s more obvious than ever that the band is really a brand and it’s completely Jon’s show to run. I think as he’s getting older, Jon has started to come off as a bitter guy for whatever reason, he denounces the ’80s hair metal scene they were fully-fledged members of at one time and he just seems to be on a power trip with only Richie having the smallest say in what the band does. To me, their last decent effort was 2002’s Bounce and with a few song exceptions, anything they’ve done since has been extremely bland and lacks the hooks and catchy choruses they built their name on in the ’80s and ’90s. So anyway, this is the band’s fourth compilation album. Though to most fans, it’s really more like their second legit straight-forward compilation. 2003’s This Left Feels Right was an acoustic reworking of many of their best known songs and 2001 saw a Japan-only greatest hits released called Tokyo Road. The very first compilation was Cross Road. It was released in 1994 so given that the band has had a number of hit songs and albums since then, it was definitely time for another recap. The tracklist is pretty solid. Sure there are personal favorites I could say I would have liked to seen included but keeping with the “greatest hits” theme, the album does it’s job. Especially in the Ultimate Collection form. It reads like a set list of what you would probably hear the band play in concert these days. I was caught off guard by “Someday I’ll Be Saturday Night” (which was a new song included on Cross Road) and These Days getting two songs included but it’s cool because I like all three of those songs. The only studio album not represented on any of the U.S. releases is 7800° Fahrenheit (“In and Out of Love” and “Tokyo Road” appear on international versions). There are a few different versions of this album. First there is the simply titled Greatest Hits, which is just disc one (featuring two new songs). Then there is Greatest Hits – The Ultimate Collection which features a second disc (and two more new songs). Then there’s also a Target edition of Greatest Hits which has all of disc one plus live versions of “Diamond Ring” and “We Weren’t Born to Follow”. Then the iTunes version features all the material from disc one and two plus a 5th new song called “This Is Our House”. I definitely wanted The Ultimate Collection because all four new songs were slowly being released on the band’s website for streaming and I liked them all a lot. Someone pointed out to me that they all sounded like modern Bon Jovi (which we’ve already covered I don’t like) and I guess they are right. Maybe I’m just ready to like Bon Jovi again? Who knows! “What Do You Got?” is my favorite of the new songs but I think they’re all good. Maybe not songs that can compare to their classics but very good for modern day Bon Jovi, I think. So I’m happy with my purchase. 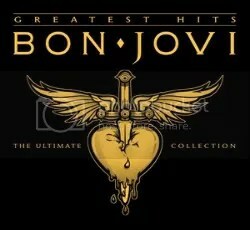 I’m enjoying the new stuff and while I don’t usually bother listening to compilations these days, you really can’t go wrong with a collection of Bon Jovi’s greatest hits. 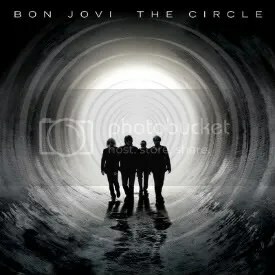 It’s hard to believe after only releasing two albums in the 1990s that Bon Jovi is now on their fifth studio release in the 2000s alone (The Circle is actually their sixth studio release if you want to count their acoustic reworkings of their own songs on This Left Feels Right). And I haven’t even mentioned the live album and box set they released this decade! So yes, the band has been extremely active this decade with a steady stream of albums and world tours that sell out wherever they go. The downside to all of this? Their music overall hasn’t been up to snuff with their ’80s or even ’90s output. Their “comeback” album Crush was great, different but great. Bounce rocked harder and was really good. After that, the band has turned into a bland rock band that doesn’t really rock at all and they’ve dabbled way too much in country rock in an attempt to stay relevant (but it worked for a bit, so what do I know?). In hype for this album, Jon and Richie promised they were done with Nashville and that the album’s title was a reference to the band coming full circle and getting back to rock ‘n’ roll and that they were giving us a “big rock record”. Well, I can tell you this much — thankfully, most signs of Lost Highway are gone (perhaps lost?). I wouldn’t say this album is “big rock” at all, but it is a better effort than Have a Nice Day even if it still sounds similar to that release. I had been hoping this would be closer to Bounce (“Bullet” comes close), but no dice. I realize that the band is laughing all the way to the bank with the steady stream of bland, safe rock ‘n’ roll made for their soccer mom fans, but I really wish these guys would pay attention to the minority of fans that want a harder edge and huge sing-along choruses. I don’t expect a sequel to Slippery When Wet or New Jersey (though the band does offer up the bass line from “Livin’ On A Prayer” for “Work for the Working Man”), I don’t want a nostalgia release, but throw me a few bones! Give me a couple of songs that have that feel good over the top vibe that band had up until Keep the Faith. Noticeably absent is the classic Bon Jovi sounding ballad that doesn’t care what decade it is. Even on the awful Lost Highway the band managed to squeeze out the under appreciated “(You Want to) Make a Memory”. Desmond Child co-wrote that song and he helps out a bit on this album, but even his involvement can’t save this album. Ultimately, The Circle is another collection of mediocre, thoughtful and mature rock songs (Just like U2!) that don’t please this old school Bon Jovi fan and I can’t imagine reaching for this album in the future. The CD/DVD limited edition comes with the 75 minute B&W documentary When We Were Beautiful, which follows the band on their Lost Highway tour from 2007. It’s a pretty interesting look into the workings of the band. Four years after the band peaked with New Jersey, here comes the slide into mediocrity (which would be fully explored in the 2000s). This album is a mixed bag (the first half is good, most of the rest is filler), but it signaled a somber, more mature sound that would be taken even further with These Days from 1995. 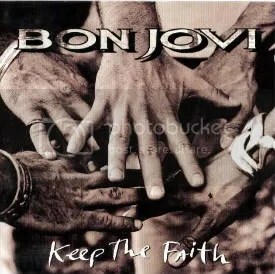 In general, Keep the Faith shows the band’s decision to rock a little less and age into an adult contemporary rock act. Filler starts popping up with “If I Was Your Mother”, but the excellent & epic “Dry County” (Bon Jovi going the Springsteen/Mellencamp route) and “I Want You” (a power ballad that would sound right at home on Slippery When Wet or New Jersey) and worth skipping too. Outside of those two songs, the second half of this album features some of my least favorite Bon Jovi songs. The odd thing is, the album overall shows the band getting softer and slower, but “If I Was Your Mother” and “Fear” are two of the heaviest songs the band has ever done. Perhaps they were trying to compensate for the rest of the album?